This is an ode to a breakfast noodle house I visited in Ha Giang, the provincial capital of Vietnam’s northernmost frontier. Although it has changed considerably (see updates at the bottom of this article) since I first ate there, in late September 2014, the experience has been echoing inside me ever since. 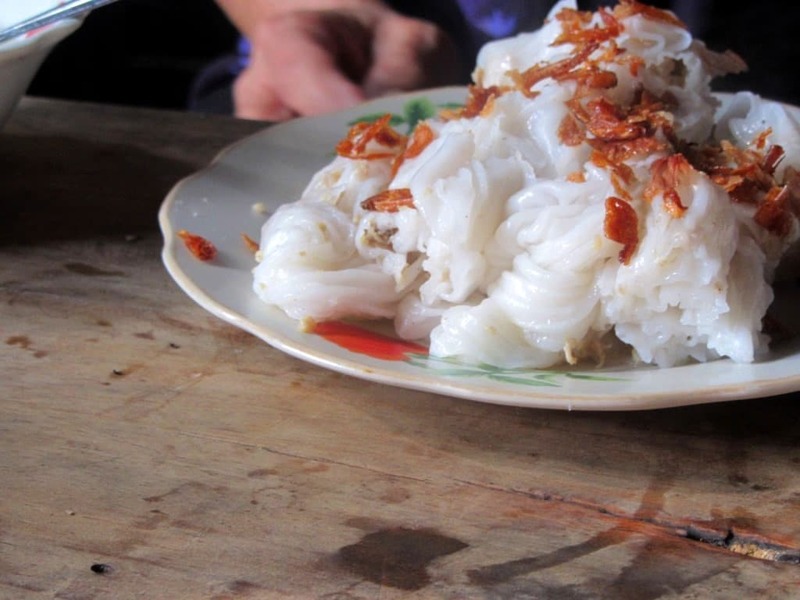 The noodle house is a small, family-run business, specializing in bánh cuốn (steamed rice flour rolls), a favourite breakfast in the northern provinces. 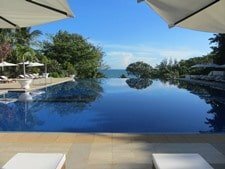 The best informal dining establishments in Vietnam are those that find the perfect balance and interplay of three key elements: food, people, and place. This can result in a deeply satisfying and memorable experience. 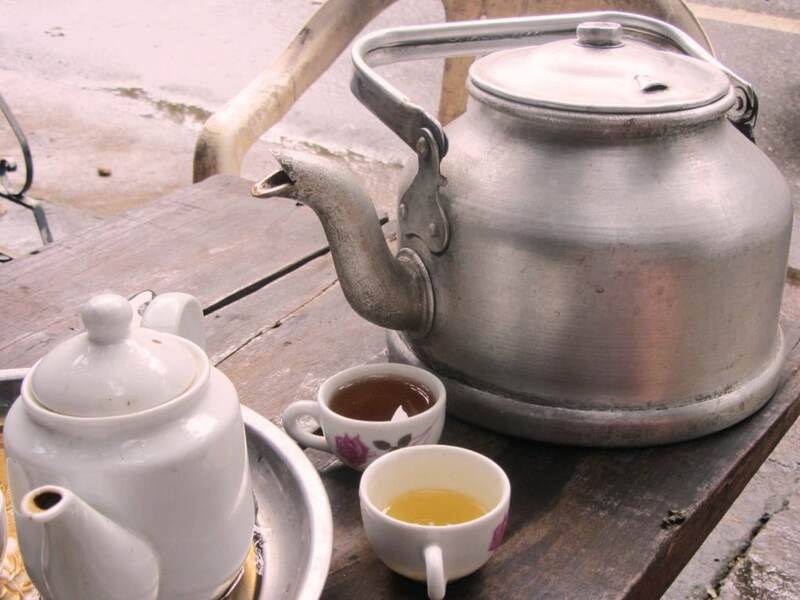 Breakfast in Ha Giang was one such occasion. 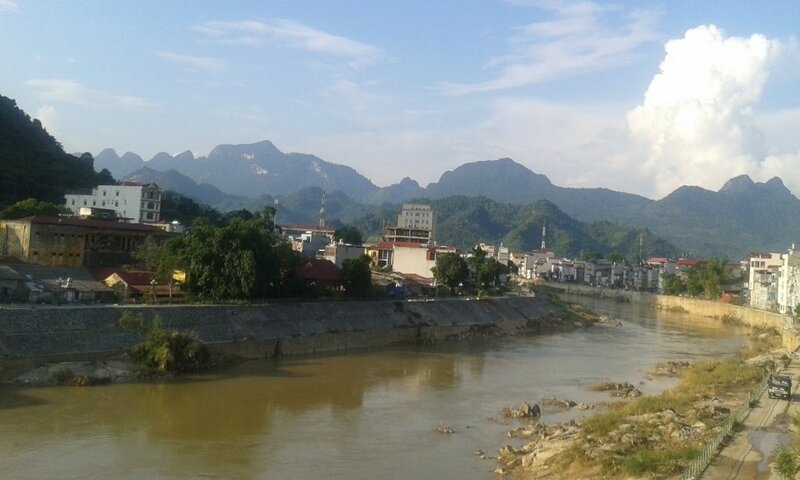 Ha Giang is a small, fairly prosperous city on the banks of the muddy Lô River, some 300km north of Hanoi. Green limestone mountains encircle the city, their crenulated ridges forming a fortified wall around this provincial capital, beyond which lies China. 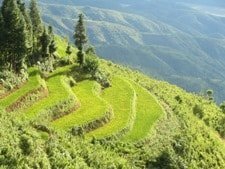 Exceptionally bleak on cold, misty, wintry days, Ha Giang is at its most attractive during the warm, clear weather of late summer. In the rainy season the river floods regularly, causing the water-level to rise above the ground-floors of the townhouses along the riverfront. 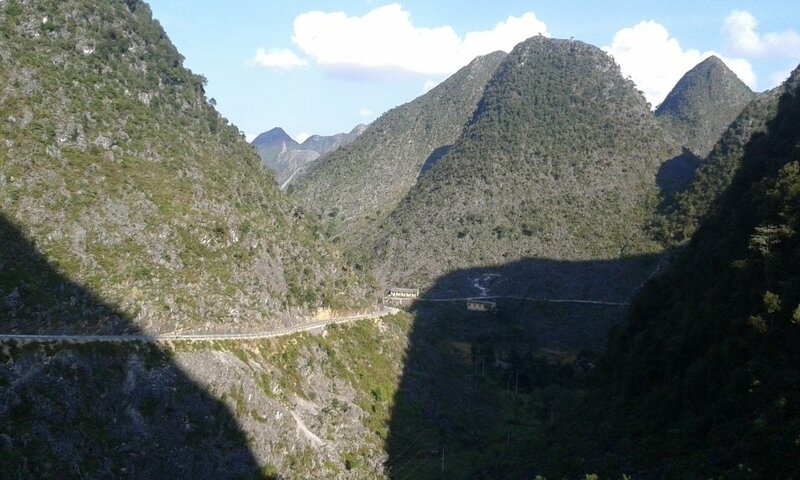 Ha Giang is the gateway to one of the most remote and dramatic landscapes in Vietnam: the Dong Van Karst Plateau Geopark. 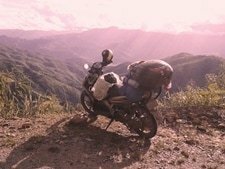 There’s a tangible excitement among the handful of travellers who make it to this city, as they prepare themselves to ride the legendary Ha Giang Extreme North Loop. As such, breakfast in Ha Giang has an edge: this could be the meal that kick-starts a day you may remember for a long time to come. 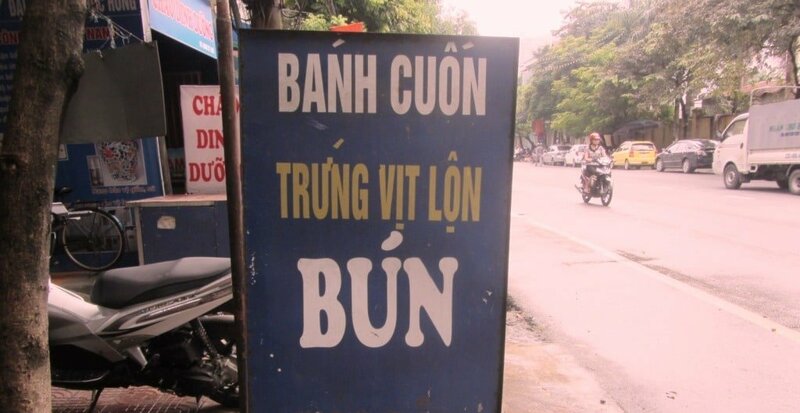 At the southern end of Nguyễn Thái Học Street, along the east bank of the Lô River, is where I found my breakfast. The dilapidated façade of this nameless noodle house caught my eye immediately. 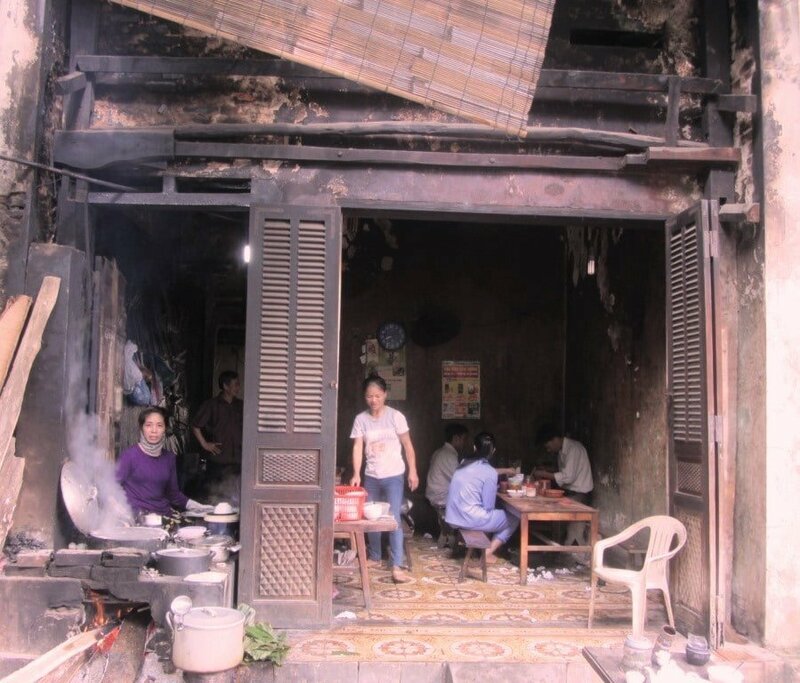 A ramshackle, single-storey shophouse, the brick, wood, and concrete exterior is so blackened by cooking smoke and soot that it appears to have suffered through a serious fire. Floor to ceiling wooden shutters open onto a small front yard where a wooden table hosts the tea and tobacco station, typical of northern dining. A bamboo blind is haphazardly rolled up above the entrance: during the rains, or on cold winter mornings, the blind is rolled down to shelter customers from the chill. Tucked into a corner of the premises, a black-stained, brick hearth represents the kitchen. A clutter of rough-cut, wooden planks lean against the wall. Every fifteen minutes one of these is fed into the fiery hearth to replenish the flame beneath large pots and pans. Inside the noodle house, the floral-patterned tiled floors are strewn with tissues, squeezed halves of kalamansi, tooth picks, puddles of soup and other food-related detritus (always a good sign in Vietnam). The plaster is peeling off the bare, concrete walls which have aged, moulded and burned in varying degrees, creating a collage of textures and subtle, overlapping plains of colour, reminiscent of a Rothko canvas. Diners sit at wooden tables on wooden benches and stools, hunched over their breakfasts. The wooden surfaces are chipped and scratched, but the fluid wood grain is still visible. 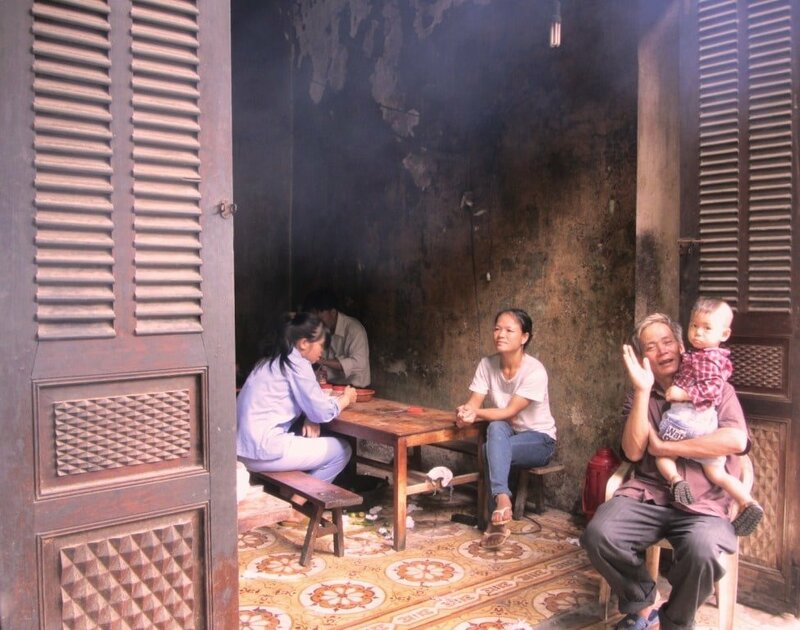 A couple of naked light-bulbs swing from the high ceiling, but all light – even the daylight – is obscured by clouds of cooking smoke and the fumes rising from bamboo pipes of Lao tobacco, smoked at the communal tea station out front. In a way, each and every customer has left his or her mark on this breakfast house. Like an ancient, revered monument, its scars tell a story, and their presence add to the character of the building. This soup house wears its years with dignity. I am not repulsed by its dilapidated state, quite the opposite, I am drawn to it precisely because of its worn appearance. Even if the food were of average quality I would still enjoy dining here immensely. Pot, pans, bowls, plates, tea cups, chopsticks, scissors and knives are scattered about the dining area, as if the pieces of a puzzle waiting to be put together. There are beautiful ‘still-life’ corners everywhere – I wish Cezanne or the Dutch still life artists were alive; they could put their talents to work and capture these scenes, rich with a rustic, domestic charm. Bánh cuốn is very popular in the north of Vietnam, rivalling even phở (beef noodle soup) as the region’s favourite breakfast. Cooking and serving these delicate, steamed rice flour rolls is a fascinating and intricate process. 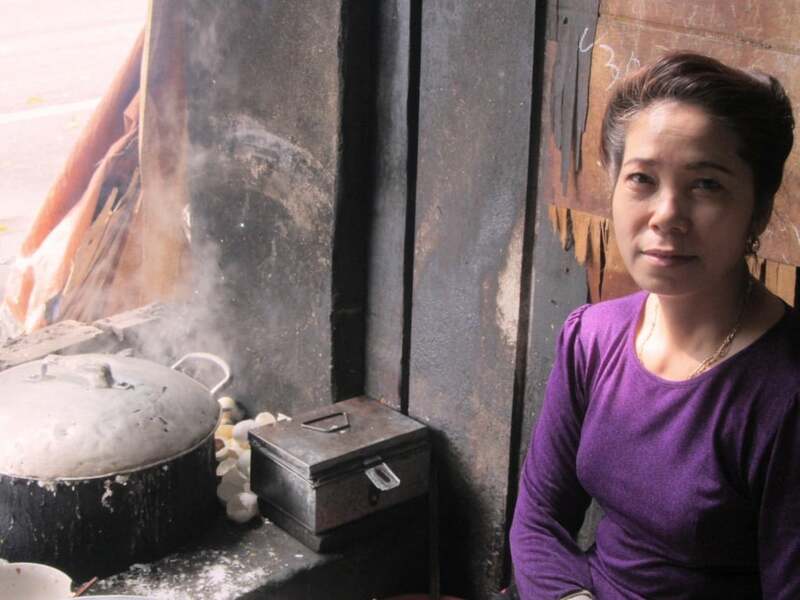 Like all the best informal eateries in Vietnam, the noodle house in Ha Giang is a family-run business. Three generations of men, women and children work together. Food preparation, cooking, serving, cleaning, accounting – each family member has a job to do. It’s an efficient and highly organized unit. The main ‘performer’ in this particular family is the middle generation mother. Unfortunately, I’ve lost her name in my notes, but for the purpose of this article I will call her Duyên, meaning ‘graceful’, which is appropriate in this case. 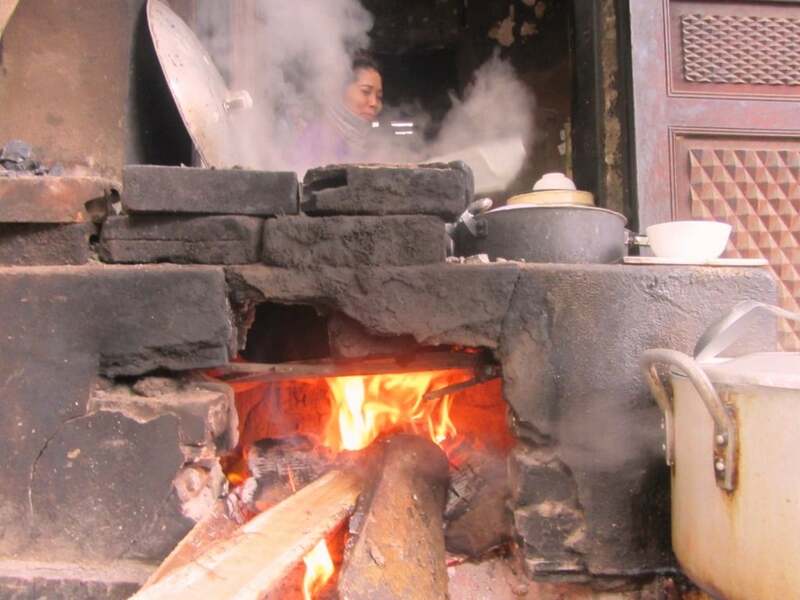 Duyên is seated behind the hearth. Her job is steaming and serving the bánh cuốn. She is a middle aged woman with a proud, upright posture, a cautious smile, and dark, kind eyes. 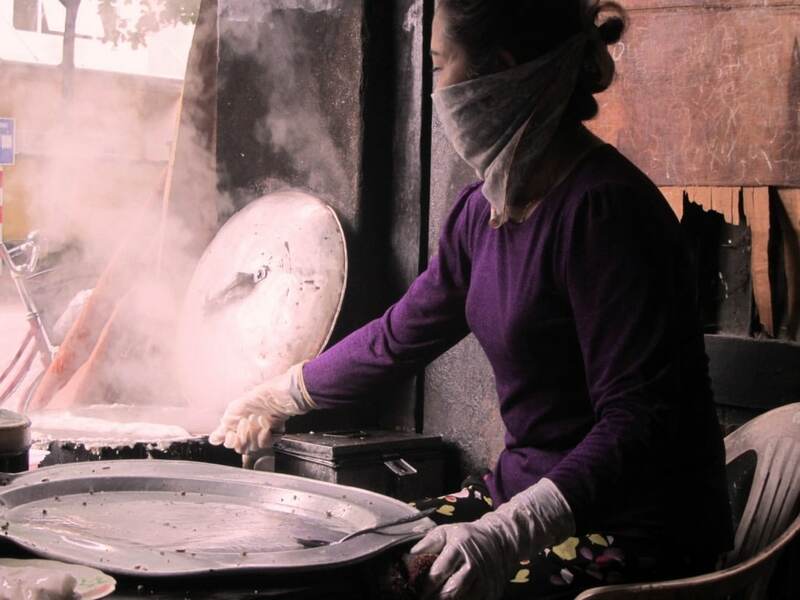 Duyên wears a cloth scarf, which she pulls up over her face, to keep the steam and woodsmoke from her nose and mouth. Dressed in a purple cardigan, she merges with the dark, charcoal tones of the breakfast house as a whole. She cooks and serves with elegance. Her actions are fluid and graceful, yet controlled and full of purpose; as if she were playing a complex musical instrument with great skill and touch. A cloud of steam engulfs her each time she lifts the lid from the steamer, upon which she ladles a white batter made from rice flour, spreads it over the circular stretch of thin material above the simmering water, and puts the lid back on, leaving the mixture to steam for a few minutes. Taking the lid off again and delicately lifting the resulting layer of rice flour pasta with a chopstick, she unfurls it on a wooden board until it regains its circular shape. Then, filling it with a combination of pounded pork, finely chopped wood ear mushrooms, garlic, onions and pepper, she rolls the circular noodle into a cannelloni log. These rice flour rolls are garnished with crispy roast shallots, dill, and slices of cinnamon-flavoured Vietnamese pork sausage. The bánh cuốn are served with fresh herbs and bean sprouts, and the all-important sweet but mild nước mắm sauce, which moistens the dish and brings all the disparate flavours together. Tiny red chilies, chopped into centimeter thick slices, burn brightly on a small side plate. 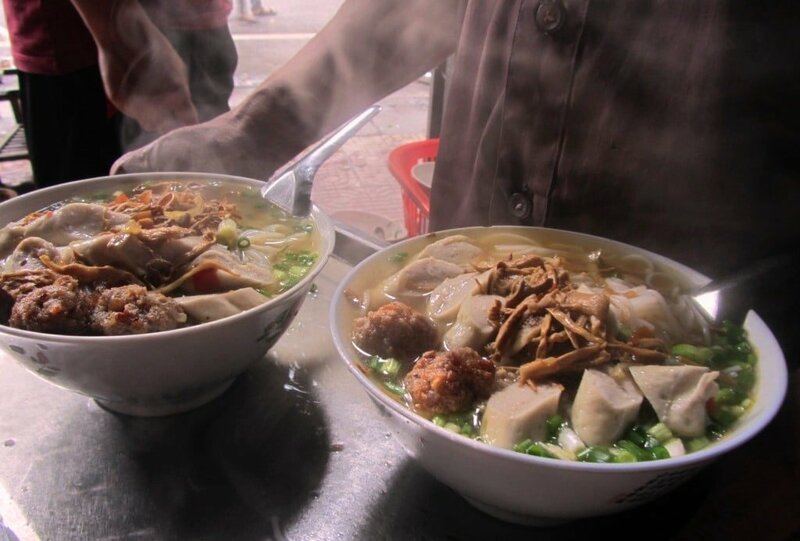 And there’s more on the menu at this Ha Giang noodle house: Bún chả, a rice noodle soup with pork patties, is another classic northern breakfast, of which great steaming bowls are paraded out of the kitchen on metal trays, and nursed carefully to customers’ tables. For the adventurous, there’s trứng vịt lộn, a partially fertilized duck egg. A warming comfort food – especially on those cold, northern mornings – the eggs are served with ginger and herbs (read more about them here). This is a breakfast eatery, so get here between 6am and 9am. Prices are between 20-40,000vnđ ($1-$2) depending on what you order. There’s no menu: just sit down and do your best to communicate – you’ll always end up with a plate of good food so there’s nothing to lose. 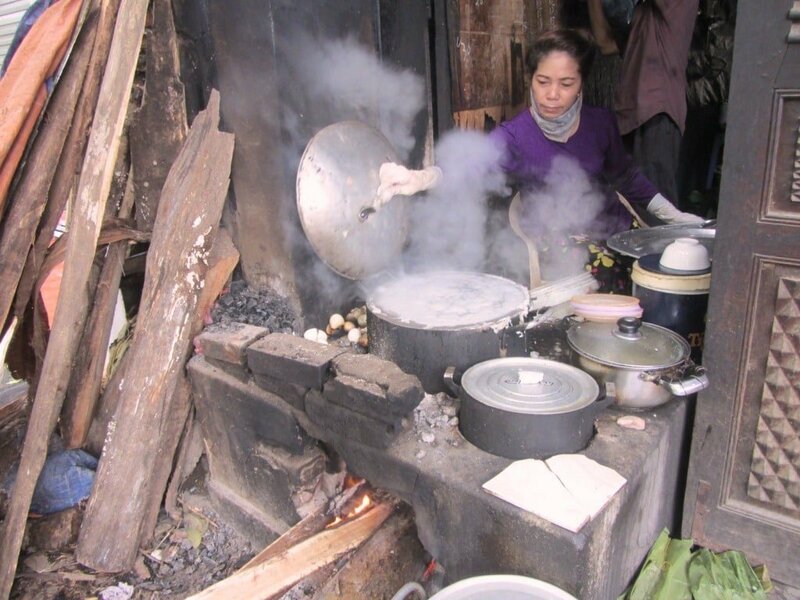 I’ve been meaning to write about this noodle house in Ha Giang for many months, and still now, as I go through my photos, notes and memories, it stirs something in me: a warmth, a love, a longing, an excitement. 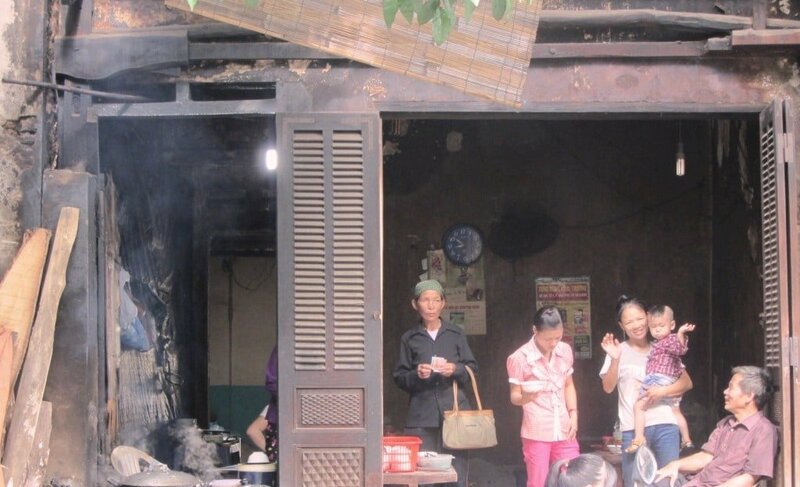 It’s a pleasure to have eaten here, and to be in Vietnam while these kind of places still exist. It’s not so much about the food – although all the dishes are very tasty – it’s about the overall experience: people, place, and food. Update & Afterword: Since I first ate at this noodle house and wrote about it in 2014, major renovations have taken place. The family, food and address are the same, but the decor has been ‘updated’ beyond recognition, and the sign outside is now yellow (although the blue sign is still sometimes used too). 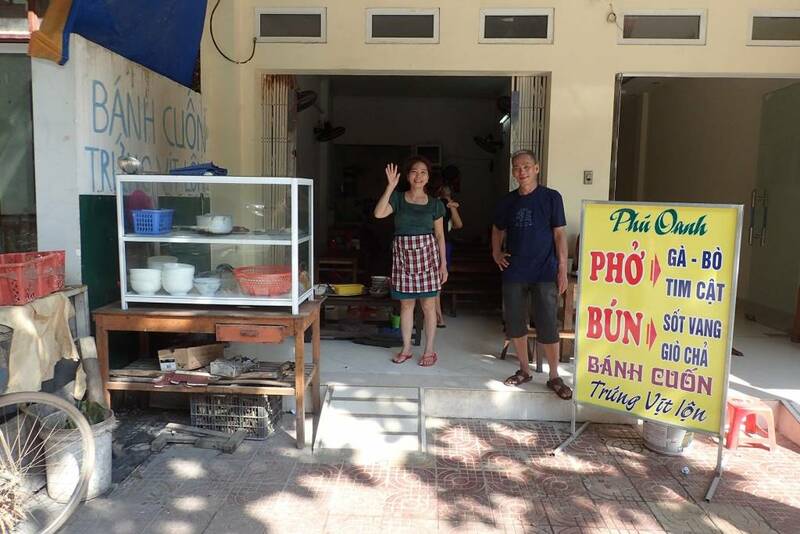 It seems the noodle house now has a name too: Phú Oanh. See the image below, courtesy of reader Reinout Spitaels, who kindly wrote to inform me of the changes, before I got a chance to go back and see them for myself in October 2017. 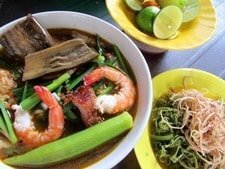 This entry was posted in ALL, FOOD & DRINK, Ha Giang Food & Drink, Noodles, Street Food and tagged banh cuon, breakfast, food, guide, ha giang, street, Vietnam. Bookmark the permalink. Hey Tom, thanks for this place! The point on the map is not in the right place, it’s a bit closer to Minh Khai street, but the blue sign is the same. Great writing and pictures. 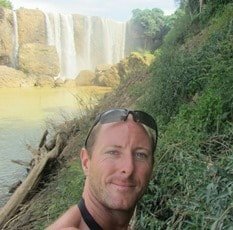 I love keeping updated with your inspirational travels in Vietnam. What a beautiful article. 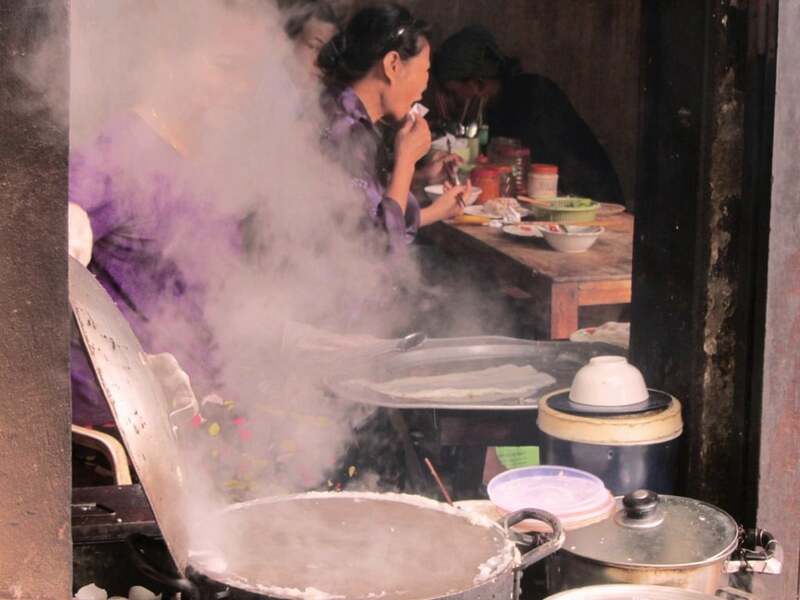 We loved Ha Giang and had probably our best meal on the road at a small Com Pho there. Your article is a piece of art. The detailed description outside and inside of the little restaurant, the hearth, the woman, the food … are classic. I wish and hardly found Vietnamese writers care about this corner of the world, so rich in culture, tradition, honest people plus magnificent scenery. The picture of the noodle bowl with meat pieces (chả) and broth is probably not Bún Chả in traditional meaning. Bún Chả is noodle with grilled pork and nước mắm pha and some veggies. 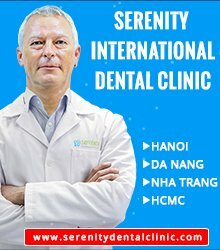 Maybe in Hà Giang they called it Bún Chả in my opinion. Thanks for sharing your experience and travel stories. Thanks, I’m glad you enjoyed the article.